Some energy is moving! It’s pretty fantastic! For those of you that know me, know that I don’t go to church and I don’t like church for multiple reasons. Well, today I WENT to church! There is this little outdoor church across the street from my place I walk past it every time I go to the beach. They have these silly signs all around the area. They say things like “same management over 2000 years or don’t worry our lifeguard walks on water.” It’s pretty funny to see these signs. It adds some humor to your everyday life. Any who… I walked past the church a few days ago and something small inside me said go to church this Sunday. There is something for you there. I have been looking forward to seeing what the church is like the last two days. Last night, I was having emotional feelings that were letting me know there is something that needs to be worked on. Jon and I spoke about what’s been going on. It wasn’t the best conversation because I left feeling disconnected. I felt as though we were not on the same page. I wrote in my journal and went to bed. This morning I didn’t want to get out of bed. My head hurt from crying and being anxious. I knew I had something to learn from church so I got up, got dressed and went to church. The sermon was on “shifting your perspective.” He was speaking about a lady he ran into that had a perspective that was not a healthy or positive perspective. In the meeting with her, he realized that we all have a perspective and it can be tainted by our past. I am not one that believes in God, I believe in the universe as a higher power. So, I had to change some of the things he said to reflect my belief. I had to shift my perspective. This hit me because if you seek the truth it will be found. If you let the thought and ways of the past go and turn to the universe it will have mercy on you and give you the knowledge you need in the moment. Our thoughts are not ours. They are what we have been told by the ego and the past. Once you realize this we can see things differently. Something I was having trouble doing last night. I was seeing things as I would have seen it a few years ago. Although, a part of me wanted something different, which I now understand. Since I couldn’t get the whole script down I googled it. When I googled it, it gave me Isaiah 55:9 as well. It says “as the heavens are higher than the earth. So are my ways higher than your ways and my thoughts than your thoughts.” The universe is a higher power, its ways and thoughts are of a higher vibrations that can guide us to the truth. I realized that I needed to let go of the thoughts of being disconnected with Jon and see what the universe had for me. See the higher vibrations. I am now on the same page with Jon. We were able to connect in the same higher vibration today as I explained what I was learned at church. Next, the pastor went on to the next scripture which was John 3:16-17. “For God so loved the world that he gave his one and only son, that whoever believes in him shall not perish but have eternal life. For God did not send his son into the world to condemn the world, but to save the world through him.” Whoever believes will not perish but have eternal life was something the pastor emphasized. It is very important to do this because whoever believes in the universe and follows the laws of nature will have eternal life. When you do the work to follow the path the universe has for you, you have life and freedom. You save the world because your growth is passed on to other people. It grows so that others start to make changes because they see what you have and they want it. They want eternal life. The pastor said “when we understand the truth in our hearts we start to see things differently.” This is so true. In order to change your perspective you have to understand the truth in your heart. This will lead to different things, a different life. The truth in my heart is I am where I am supposed to be. I have a great fiancé that pushes me to see things differently and I the same for him. We grow together because we believe we have eternal life. “Things change when our focus changes.” So, the question he asked was… What is Jesus’ view of you? The way I heard it was, What is the universes view of you? The view in which the universe or Jesus sees is not what you think. The view is not blocked by ego, or the past. The view is of love and understanding. The universe or God see in you someone who has purpose. We all have a view that we see ourselves that are shaped by our past. We need to rethink and unlearn that way of life. We need to shift our perspective to a wider and more focused lens. Romans 8:38-39 says “For I am convinced that neither death nor life, neither angels nor demons, neither the present nor the future, nor any powers, neither height nor depth, nor anything else in all creation, will be able to separate us from the love of God that is in Christ Jesus our Lord.” To shorten this, when you are convinced…. Nothing can separate us from the laws of nature, or the universe. Do you live in accordance to the universe? 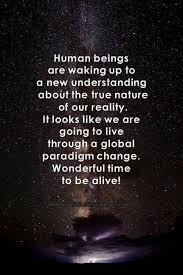 Are you doing things that in line with the higher vibrations of the universe? If you are living in accordance to the universe, if you are convinced… what room do you have to worry? What place does anxiety have in your life? There is not room for worry or anxiety when you are living out the universe. I say this because last night I was worried about what will happen with Jon and I. I was anxious that this year apart would lead us apart. This really hit home for me. I remembered that if I am doing what the universe has set out for me I know that I will not be lead astray. There is no room for worry because I have all that I need now. And I will always have what I need because nothing can separate me from the universe. “Perspective is a reflection of our heart. SO listen to your heart, to the universe and live in it. Live in the freedom. When are you going to allow yourself to live in the truth? If you really believe when will you forgive yourself? I was worried last night that the same thing that happened in my past marriage would happen in this relationship. The pastor said “your past is real and it was big. It’s stopping you from really living and seeing the truth.” My past marriage was huge, it was real. It’s not now and it’s no where near what the universe has instore for me. My current relationship and future marriage with him is not my past marriage. It is something more because I am allowing the universe to show me what the truth is, what my marriage is supposed to look like. To do this we have to reflect and shift our perspective. The pastor left us with a how to. Most churches that I have been to do not leave you with a how to. He did and it was perfect. So, I leave us with a how to… How do you shift your perspective? Start with honesty. Start with being honest about your life. Be honest that we are not our past and we are more. Start with being honest with our actions and the consequences they have. Be honest with our hearts!